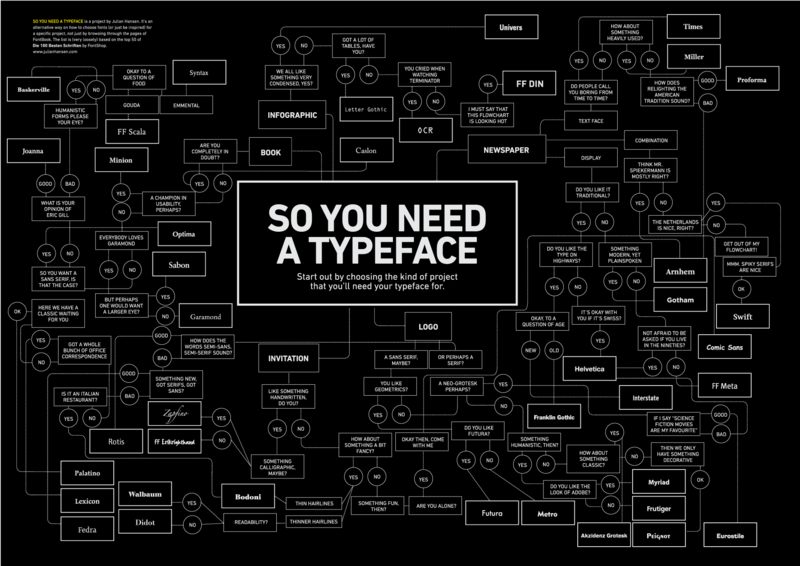 If you ever have trouble picking a typeface, check out this handy flow chart that leads you through the process. It’s not just handy, it’s also really funny. “Everybody loves Garamond” and the like. Also one on the trustworthiness of beards. Thanks to all the people who sent this in! Thanks to Systemic MichaelK42 for posting a link to this awesomeness in the (still raging) comments section of the “Bike Rep” comic from Friday. Too great to not share and bring up. Thanks, MichaelK42! Infographics AND tacos? Where do I sign up!? Last fall a group of CCA architecture students, led by Landscape Architect David Fletcher and Rebar art and design studio shared a meal together at a local taco truck for a class assignment. Our research seminar explored San Francisco’s food and wastesheds. Our premise was that a seemingly simple, familiar food like the taco truck taco could provide visceral insight into the connections between the systems we were exploring. Turns out it was pretty tough. Big twist, right? Anyway, there was a talk that we already missed, but the chart is still sweet, even at the small size it’s shown. If anyone finds more about the talk let me know. LINK. In case Monday’s comic on curling whet your tastebuds for curling (check out the comments), here’s a great infographic from GOOD about how curling works. I’m not seeing any “curl”. LINK. My brother says this is begging for the Heisenberg Uncertainty Principle, but that would ignore all my friends in the world of social sciences. Instead, the Observer Effect works just fine, which gets at the root of the issue. UPDATE: Systemic MikeASchneider has alerted me to the similarities between this comic and one done by XKCD. No piracy was intended, and I maintain that this one is prettier and better kerned. While I’m a fan of XKCD, I can’t say I’ve read every one. Great minds think alike, I suppose? For those wondering where all the graphic design jokes have gone, stay tuned. They aren’t far off.